I would like to thank all the posters to the group. Your knowledge has helped me in my quest. 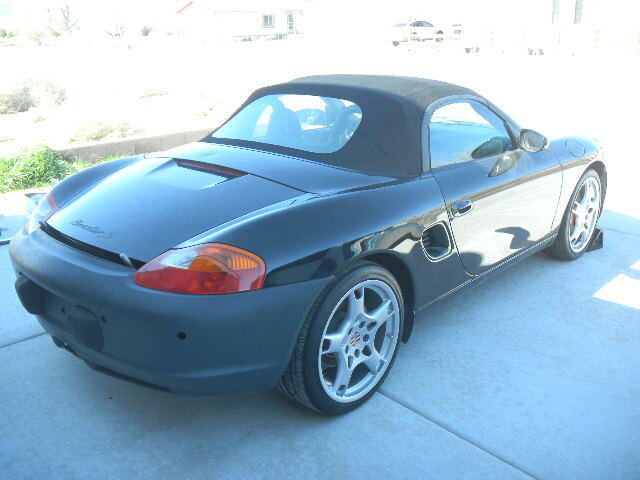 I purchased a " dead" 2000 Boxster S from a dismantler before it was completely gone. Previous owner had purchased in August and sold in January-Oil in coolant. It did have new coolant tank and evidence of previous leak in rear trunk. It was missing front trunk lid ( 2 ft. of water in front trunk! ),battery missing,along with Steering Wheel and air bag. The driver's window down, immobilizer soaked,mildew on driver's seat, door panel, and dash side. pollen filter dirty,rear bumper missing, spoiler (early type) off in trunk, ashtray and cover missing. No oil on dipstick or coolant in tank. No attempt to crank made. Car was rolling on 2 spares and 2 aftermarket "CUP" wheels which had seen better days-4 spoke steering wheel w/o air bag installed. Evidence that back console and speakers removed from indentations in rear rug. STRONG HINT: BUY A COMPLETE CAR! 19" 2006 Carrera Sport wheels with Michelin Sport tires (rears are worn and need replaced)These allow locks and standard bolts for mounting. distilled white vinegar to work on mildew on leather, but if that doesn't work in long term, bought vinyl door panels from 2003-4 with Bose speaker covers, actually later panels look better to me than early. Rear console from E-bay, speaker kit from Sunset. Pelican Parts Website forum and update to projects for more info. LS376 Video's have helped me a lot! So that leaves the engine problem. 75009 miles on odometer, M96.20 engine with oil in coolant, sold to dismantler at give away price. Porsche wants $1000 more for core than replacement remanufactured engine cost. Let's just say 43K(with sales tax) plus you pull and replace, with 15 year old ancillaries. Do it yourself -unknown cost and problems-plus learning curve and tool's.cost. Or have independent shop, one quote, minimum cost" could be around 8K to ?" Current market price for Boxster S? Will rebuilt engine be reliable? alternator, A/C Compressor, engine harness, oil pressure switch,engine compartment temp switch and will try to use oil level sensor along with new dipstick. I was impressed by the Renegade Hybrids conversions of the 928,996 986 and 987C. Making a pest of myself, I visited the shop when I could, asked questions and tried to take pictures ( I am lousy photo taker!) and finally pulled the trigger. Last week I took delivery of LS-3-480 hp with ECU ,Corvette oil pan,oil pickup, windage tray and Corvette engine mounts. I previously had picked up the kit from RH and exhaust components. Also picked up factory hard top. Next, to get 2 post lift installed, when I get home from current trip. I purchased female sockets(from Pelican) to get seats out, so can strip interior for conversion. I stripped the front and rear trunks of carpet already. Once top disconnected and removed, will pull electrical brains - before welding. I have checked current instrumentation and controls-Oil level,Oil Temp,Airbags- read bad. Even radio works with code, climate control,wipers, lights and mirrors. Everything is still connected, so will try to move convertible top to maintenance position, after check relays and micro switches (first attempt failed). Any other hints, gratefully accepted! For those doing the conversion using the RH kit, each builder will differ in the build of their project. You have different years, engines, design intent and skill level. Everyone will do things "their" way. Your budget will determine a lot of of your time required. If you are modifying a junk yard engine and spending your time looking for parts to use and comparing prices, I think you will be surprised as to how much time you use. I was surprised how long it took, just for finding hardware for mounting components and hoses That's why I went with crate engine, but if you can find 2008 Corvette for good price, in good shape with manual ECU, you could change cam later. cover opening behind seats after LS-3 installed easier than anything else you can find. Thanks for the engine cover tip, I will definitely look into that! So you are just starting your build? You should check out my roller, it would probably cost more to bring it to original state than the car cost brand new. EDIT: NM the stuff above. I just realised we exchanged some PMs earlier this month. The car is looking good, I love the rims! Last edited by martsink; 03-23-2015 at 09:34 PM. I love your description of the condition of the car when you got it. It sounds like quite a project. Good luck with it and keep posting as it progresses. I think that we are going to see some growth in the interest and demand alternative engines over the next couple years. Excellent to get the full story on your conversion Bill! Looking forward to seeing your progress and let me know if I can help!